Having a conversation in Spanish can feel scary at first. There are so many things that could go wrong! You forget a word or some grammar mid-sentence. You don’t understand what they said to you. You’re not sure what to say. When you start speaking Spanish, these little communication breakdowns are a normal part of the learning process. But if you’re smart, you can turn these seemingly tricky moments into opportunities to learn more, by using a few strategic Spanish phrases. Keep the conversation going in Spanish, even if you forget a word or don’t understand. Stop people from replying in English. Strike up a conversation with native Spanish speakers. You’ll also pick up tips on where to find Spanish speakers to practise with. Point and say: “one of those please”. The first phrase will keep you stuck in touristville. Option 2 will help you strike up a conversation with a Spanish speaker and learn a new Spanish word at the same time. Most Spanish speakers will welcome this kind of curiosity – once you start a conversation like this, you’ll probably end up chatting for a little longer, giving you a friendly way to keep practising your Spanish. The more you use Spanish phrases like this, the longer you can keep the conversation going. And the longer you can keep the conversation going, the better you’ll get at speaking Spanish. That’s why I’ve teamed up with Juan from Easy Spanish (a fab YouTube channel for Spanish learners) to bring you 13 essential Spanish phrases. In the next section, you’ll find a video tutorial with 6 Spanish phrases to help you get unstuck and communicate better in Spanish. Then, you’ll find 7 basic Spanish phrases for everyday conversations. For this part, Juan went out onto the streets of Mexico and posed simple questions to passers-by. In this video, you’ll hear Spanish small talk questions being used in a natural way and learn to understand the replies you might get from native speakers. Of course, you’ll also need Spanish speakers to practise with – the last section will help you find them. To make sure you remember the 13 Spanish phrases, you’ll also find a PDF cheatsheet that you can print off and take with you. Learn these phrases by heart so you can drop them into the conversation when you need them. Get the PDF here: 13 Essential Spanish Phrases PDF. Spanish Phrase 1: ¿Cómo se dice… en español? To be used when you’re speaking Spanish, but you get stuck because you don’t know – or forget – a word. In the video, Juan used the example of “tree” (¿Cómo se dice “tree” en español?) – you can just replace “tree” with any word you need to know. Spanish Phrase 2: ¿Qué significa eso? To be used when you hear or see a word you don’t understand. It’s especially useful in restaurants – just point to the word on the menu and ask the waiter! When you ask this question in Spanish, you’ll be more likely to get an answer in Spanish, which will help you keep the conversation going. But even if they use English to give you the definition, it’s still a good way to show your conversation partner that you’re making an effort to speak Spanish. This makes it easier to go back to Spanish once you get unstuck. ¿Puedes repetirlo, por favor? Can you repeat please? ¿Puedes hablar más lento, por favor? Can you speak slower please? When you use these phrases, the person you’re talking will know exactly how to help you, so they’ll be less likely to jump in and use English. Spanish Phrase 4: ¿Puedes repetirlo, por favor? When you just need to hear the phrase again. In formal situations, you can ask: “Podría repetirlo, por favor?” Could you repeat please? Speaking too fast? Ask: “¿Puedes hablar más lento, por favor?” – Can you speak slower, please? A word you don’t recognise? Ask: ¿Qué significa eso? – What does that mean? Spanish Phrase 5: ¿Puedes hablar más lento, por favor? For those times when the Spanish speaker is going at 100mph and you’re struggling to keep up! A more formal version of this phrase is: ¿Podría hablar más despacio, por favor? – Could you speak more slowly please? Spanish Phrase 6: ¿Podemos hablar en español, por favor? Can we speak in Spanish, please? This phrase is perfect for those frustrating moments when you manage to say something in Spanish, but they reply in English! If the person seems friendly (and not too busy), simply explain that you’re learning and ask if they would speak Spanish with you. With this phrase, you’ll find that many people are happy to chat to you for a little while in Spanish. A more formal version of this phrase is: ¿Podríamos hablar en español, por favor? – Could we speak in Spanish please? Now you’ve learnt a few key phrases to help you communicate, time for some Spanish phrases to get the conversations started! In this video, Juan went out onto the streets of Mexico and asked some simple small talk questions. To make the most out of Juan’s video for learning Spanish, check out this post: 5 smart ways to learn a language by watching TV and films. In the meantime, let’s look at some of the phrases Juan used to start everyday conversations in Spanish. You can download a PDF with these phrases here: 13 Essential Spanish Phrases PDF. Spanish Phrase 7: Hola ¿cómo estás? Spanish Phrase 8: ¿Cuál es tu nombre? Alternatively, you can ask: “¿Cómo te llamas?” – What are you called? Spanish Phrase 10: ¿Qué hiciste hoy? Alternatively, if you want to ask someone what they’re going to do in the future, you can say: “¿Qué vas a hacer?”. Spanish Phrase 11: ¿Qué me recomiendas…? Great for getting recommendations from the locals for places to eat and visit etc. You can ask: ¿Qué me recomiendas comer por aquí? What do you recommend to eat around here? Spanish Phrase 12: ¿Qué se te antoja hacer…? See you later! Other Spanish phrases you can use when you’re leaving include: “Ten una linda noche” – have a nice night and “Cuídate” – take care. Let’s quickly review our 13 Spanish phrases. ¿Cómo se dice… en español? How do you say … in Spanish? Lo siento, no entendí. Sorry, I didn’t understand. ¿Puedes hablar más lento, por favor? Can you speak slower, please? ¿Podemos hablar en español, por favor? Can we speak in Spanish, please? Hola ¿cómo estás? Hello, how are you? ¿Cuál es tu nombre? What’s your name? ¿Qué hiciste hoy? What did you do today? ¿Qué me recomiendas…? What do you recommend…? ¿Qué se te antoja hacer…? What do you feel like doing? Next, it’s time to practise using them! Where can I find Spanish people to talk to? If you’re one of those people who feels confident enough to walk up to Spanish speakers and start talking, ¡muy bien! But this approach doesn’t work for lots of people. It can be tricky to speak Spanish with people you meet randomly (in shops, restaurants or on the train) because these people are just going about their day – they’re not there to help you learn Spanish. This puts unnecessary pressure on you to be able to have a normal conversation. 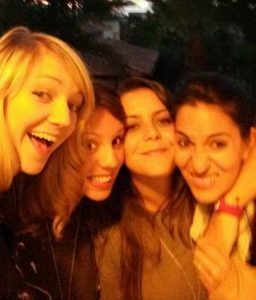 A language exchange partner: Find a Spanish person who’s learning your native language – they can help you practice speaking Spanish while you help them speak your native language. A conversation tutor: Meet a native Spanish speaker (online or in person) for conversation practice and pay them in exchange for their time. Also, they know you’re learning, so they’re expecting you to speak slowly and make mistakes. You can even take some tools with you to make the conversation easier, such as a notebook, a dictionary app on your phone and this Spanish phrases cheatsheet. So where can you find some lovely Spanish speakers to chat with? The best place to find native Spanish speakers online is italki. Here, you can book 1-to-1 conversation lessons with lovely native speaker tutors – called community tutors. They are usually pretty good value (often less than $10 an hour). 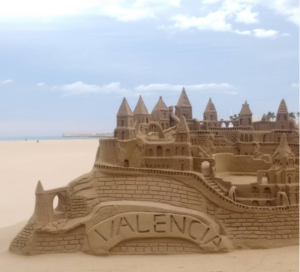 If you find it hard to practice Spanish because you’re busy, this is a great option – you can squeeze a lesson in whenever you have a spare 30 minutes, from wherever you are (all you need is an Internet connection). Alternatively, if lessons are too expensive for you at the moment, you can also use italki to set up an online language exchange with a Spanish speaker. If you’d prefer to connect with Spanish speakers face to face, you can set up an in-person language exchange, at a café or pub near you. Here are a couple of tools that will help you find Spanish speakers in your area. If you’re planning on travelling to a country where Spanish is spoken, you can use these tools to meet the locals. By setting up language exchanges in the places you visit, you’ll get to practise speaking Spanish with natives who can show you their favourite spots – a Spanish teacher and local tour guide rolled into one! Can you add any other handy Spanish phrases to the list? Let us know in the comments! What’s the difference between a Spanish learner and a native speaker? There are obvious things, like pronunciation and grammar. But there’s another difference that people hardly ever talk about. Little words that Spanish speakers use all the time, but that you won’t find in a typical Spanish lesson or textbook. The good news is, they’re quick to learn and instantly help you sound more native. In this post, you’ll learn what Spanish filler words are and how they can help you speak Spanish better. 19 little words that will help you sound more Spanish when you talk. A video tutorial on how to use Spanish filler words like a native. A Spanish conversation with realistic examples. Bonus: A mini lesson on how to pronounce b + v in Spanish! What are Spanish Filler Words? Filler words are little words and noises like “uhm”, “so”, “well”, “sort of”, “I mean”, “right” and “you know”. They’re called filler words because we use them to fill in the gaps while we’re thinking about what to say next. Spanish speakers use them all the time in natural and spontaneous conversations. Why Should I use Spanish Filler Words? When you speak Spanish, you might feel nervous about having long pauses while you think about what you want to say next. But even native Spanish speakers hesitate sometimes and when they do, they use filler words. If you can use the same words that native speakers use when they pause, this will help you stay in “Spanish” mode while you organise your thoughts. You’ll come across as a little more fluent, even while you’re hesitating! ¿Quieres ir a la biblioteca? Do you want to go to the library? Pues… ahora mismo, no… Hmm, not right now, no. 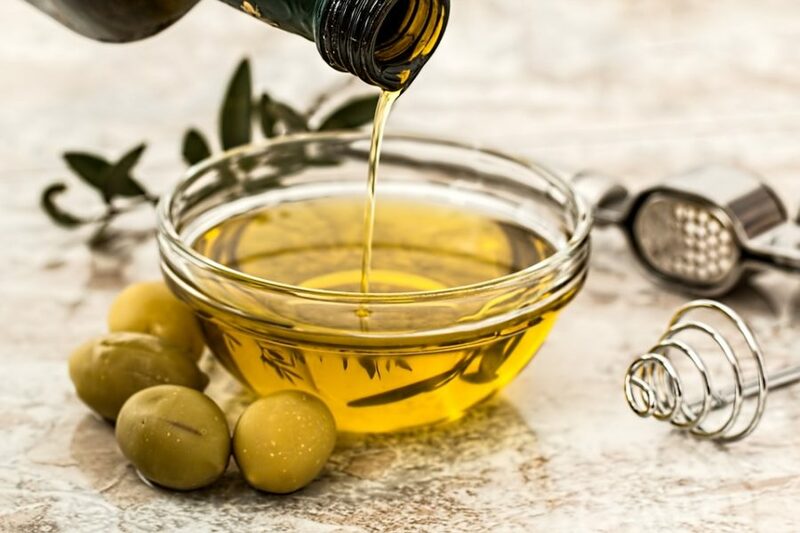 Sprinkling in some Spanish filler words is a bit like adding condiments – they’re not the main ingredients, but they add a lot of Spanish flavour. When you use them, you’ll feel more Spanish and your speech will sound more natural to Spanish ears. That said, not all Spanish filler words are the same. There are different filler words for different situations, so it’s important to learn how to use them correctly. An explanation of each word with example sentences. A video conversation in Spanish so you can see them being used in action. A free PDF download with the notes from today’s lesson. —¿Qué quieres que haga para desayunar? —Pues… podrías hacer tostadas con aguacate. —Me estoy muriendo de frío. —Tu habitación está hecha un asco. Ve ahora mismo a limpiarla. —Bueno, pero me parece que tampoco es para tanto. —¿A qué hora vamos al cine? —Oye, se me olvidó decírtelo, pero ya he quedado con Roberto. —¿Has visto mis zapatos? No los encuentro. —¿Pero todavía no estás listo? ¡Venga, que no llegamos! “Have you seen my shoes?” I can’t find them. “You’re not ready yet? Come on, otherwise we’re not going to make it! —¿No me dijiste que ibas a lavar los platos? —Es que me he puesto a mirar cosas en Instagram y al final no me ha dado tiempo. “Didn’t you say you were going to do the dishes? “Well, the thing is… I start going through my Instagram and I ended up running out of time. The best way to learn Spanish vocabulary is to hear it being used. In this video, Nacho and I will switch over to Spanish so you can see these Spanish filler words in action (+ a few bonus ones). Nacho.—¿A que no sabes con quién me encontré ayer por la calle? Nacho.—¡Con Alberto! Mi antiguo jefe. Resulta que dentro de poco es su cumpleaños y me ha dicho que estamos invitados a la fiesta que está organizando en su casa. Katie.—Ah, pues dile que muchas gracias, pero no creo que vaya. Habré hablado con él dos veces en mi vida y en esa fiesta no creo que conozca a nadie. Katie.—Oye, a ti esto de darle la vuelta a la tortilla se te da muy bien, ¿sabes? Deberías de trabajar de comercial. Ganarías una pasta. Nacho.—¡Venga, mujer! Que no es para tanto. ¿Tenías otro plan para este viernes? Katie.—Es que no sé si me apetece pasarme el viernes en una fiesta de un tío que no conozco de nada. Nacho.—Mira, vamos a hacer una cosa. El viernes por la tarde te vienes a mi casa, nos preparo algo para cenar, nos tomamos un par de cubatas y luego vamos a la fiesta de Alberto. Estamos allí una horita y si nos aburrimos, nos vamos. ¿Eh? ¿Qué te parece? Katie.—Bueno, vale. De acuerdo. Pero nada de pizzas congeladas como la última vez. O cocinas algo de verdad o no pienso poner un pie en tu casa. Nacho.—O sea, que si no me lo curro, me quedo sin fiesta. So you can keep them all together, here’s a handy list of all the Spanish filler words Nacho and I talked about in the videos. So there you have it, a few easy-to-remember words that will instantly help you sound more Spanish when you speak. Have you tried using Spanish filler words before? Do you know any others that we missed? Let us know in the comments! Listening to native Spanish speakers is a humbling experience. They blurt their words out so fast, sometimes it’s impossible to keep up. And it can be discouraging – after all that studying, shouldn’t you be able to understand spoken Spanish better by now? If you find listening to native Spanish speakers overwhelming, it could be because you’re used to the “learner friendly” version of Spanish in textbooks and apps: slow and clear with simple grammar and vocabulary. These tools are great because they make it easy to get started – like learning to ride a bike with training wheels. But Spanish speakers don’t talk like that in real life. They mush their words together, mix up grammar structures and use words you won’t find in your Spanish course. If you want to understand natural spoken Spanish, at some point you need to take off the training wheels and practice listening to real conversations. With the right tools, it’s simple. A brilliant tool for learning to understand natural spoken Spanish is the Easy Spanish YouTube channel. 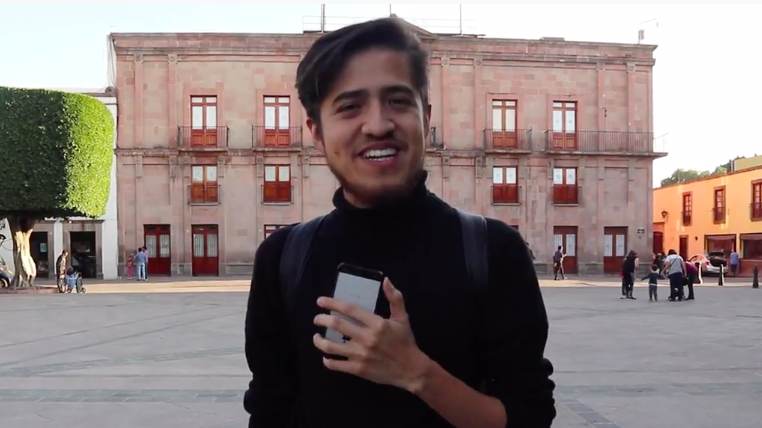 In his videos, Mexican producer Juan and friends take to the streets and ask questions like “what was the happiest moment of your life?”, “what’s the most embarrassing thing you’ve ever done” and “how do you flirt in Spanish?”. The conversations are fun, spontaneous and 100% authentic Spanish. Importantly, Juan adds dual subtitles so you can check what you heard against a word-for-word Spanish transcription, and consult the English ones if you get stuck. It’s my absolute favourite resource and I’ve recommended it in practically every post I’ve ever written about learning Spanish (see below for a step-by-step guide on how I used Easy Spanish to train my listening skills). 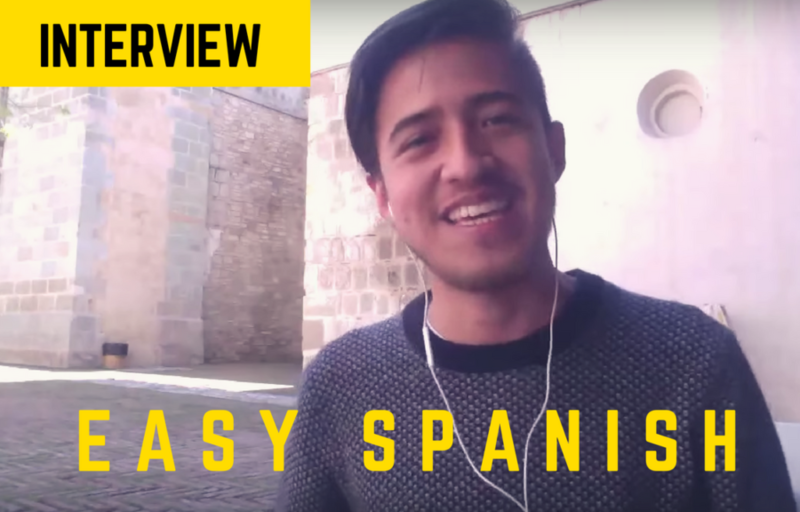 That’s why I’m excited to bring you today’s interview with Juan from Easy Spanish. In line with Juan’s mission of giving you inside access to authentic language and culture, our chat will transport you to a little plaza in Mexico, where you can see Mexican life unfold in the background with builders, policemen, and friends laughing together. Why learning Spanish with classes, books and apps is not enough. How to train yourself to understand real spoken Spanish, without leaving the house. A special technique Juan has used to learn 3 languages. For extra listening practice, the interview’s almost entirely in Spanish – if you need a little help figuring out what we’re saying, turn on the English subs. SPECIAL ANNOUNCEMENT: Once you’ve had the chance to watch, check below for details about Juan’s exciting new project, and how you can help him get it going. Help Easy Spanish go to Spain! Easy Spanish is an independent project – to keep it going, Juan relies on donations from Spanish learners like you. His next mission is to record episodes in Spain so he can keep giving you inside access to language and culture from all over the Spanish speaking world. At the moment, he’s collecting for a trip to Spain via crowdfunding. Can you help? Access to a private WhatsApp group, where you can practice your Spanish and follow Juan’s adventures in Spain. A private chat with Juan in Spanish about his experiences. He’s close to his target (but not there yet) so a donation from you could make all the difference! If you can’t donate, you can still help him by sharing the link to his crowdfunding page. Gracias! if, after listening to the word/phrase several times you still don’t understand, look at the Spanish subtitles. Compare the subtitles to the audio: Which parts didn’t you understand? Why? If there are words you didn’t know, look them up in a dictionary and write them down to review later. If you recognise the words, why didn’t you understand them? Do they sound different to how you expected? Pay attention to how sounds change in fast speech. If you need to, check against the English subtitles to make sure you understood everything. Continue until you’ve finished the dialogue, then repeat the process with a new video. By working in this way, you’ll train yourself to understand spoken Spanish and pick up lots of words and phrases that will help you sound more natural when you speak. But they can seem a bit fiddly. Are they really that important? If you want to wow people with your slick Spanish, you’ll need to get those accents and characters right. Luckily, it’s easy when you know how! With newer Mac operating systems, typing accents above vowels is simple: just press and hold the letter you want to accent. Next, a menu pops up with all the possible accents. Select the accent you need or press the corresponding number. 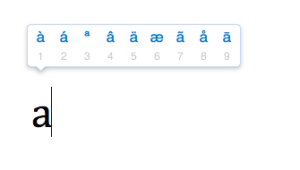 To type á, é, í, ó, ú and ü on a mac, just press and hold the vowel you want to accent. Now let go of both keys and press n again. 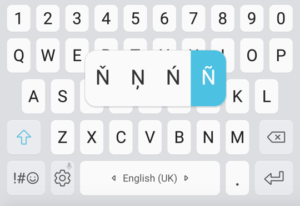 To type Spanish characters like ñ, ¡ and ¿, you’ll need to use a keyboard combination with the alt key (sometimes known as option). Whilst holding alt/option + shift, press ? The keyboard combination for the ¡ symbol may change depending on which computer you’re using (for mine, it’s alt/option + ?). 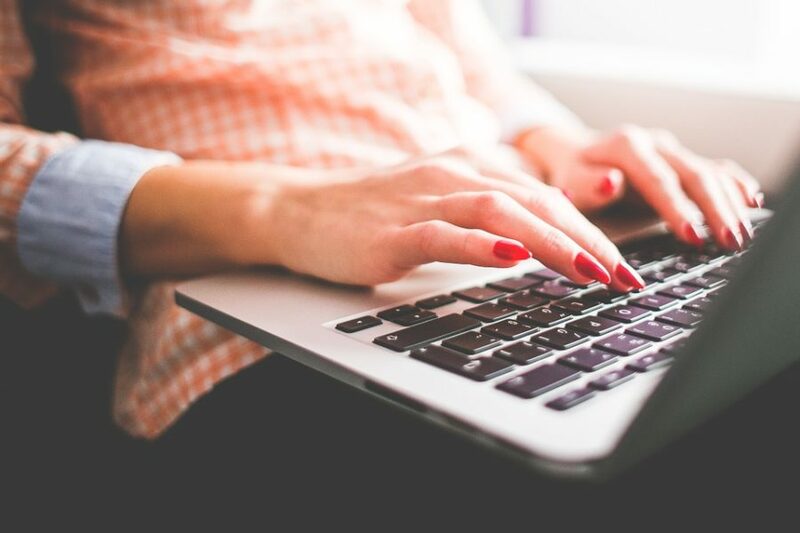 If you want to type á, é, í, ó and ú, but you don’t see a pop-up menu when you press and hold the vowel, you can type the accents with a simple keyboard combination. Whilst holding alt/option, play around by pressing a few keys until you find this symbol: ´ (highlighted in yellow). On my keyboard, it’s the number 8. Now let go of both keys and type the letter you want to accent. If you have the U.S. international keyboard installed, you can type Spanish accents on Windows by simply typing an apostrophe followed by the vowel you want to accent. ¡ = alt + ! ¿ = alt + ? You can install this keyboard by searching language settings > options > add a keyboard > United-States International. Once you’ve installed it, you’ll see a language bar has appeared next to the clock in the start bar. If it’s not already selected, click on the language and select ENG INTL. If you have a different keyboard, you can type accents and characters by holding down the alt key and typing a 3-digit number. Important: for this to work, use the number pad on the right side of your keyboard, not the ones in a row across the top of the letters. If you don’t have one of those pads, you’ll find a solution below. It’s probably a good idea to put a little cheat sheet next to your desk for a while to help you remember the codes! 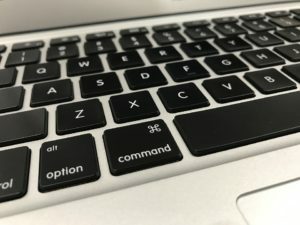 If your keyboard doesn’t have a number pad to the right-hand side, you might be able to change the keys at the top right (e.g: 7,8,9,U,I,O,J,K,L,M) into a number pad. If you have this option, you should see the corresponding numbers under each letter. Once you’ve found your number pad, you can get the Spanish accents and characters by typing the Alt+ number combinations above. 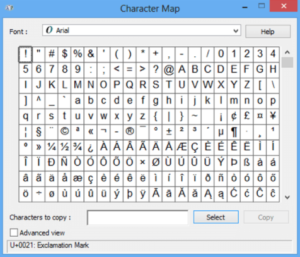 Another way to find Spanish accents and symbols in Windows is by using the character map. Go to the start button and search for character map. Scroll down to find the letter/character you want. Copy and paste it into your document. You can use the character map to type Spanish accents and characters on Windows. Searching for the letters and symbols can get a little cumbersome, so if you’re going to use a character map to type Spanish accents, you could create a new document with all the Spanish accents and characters so you have them to hand. What about if you want to chat in Spanish on your smartphone? With most smartphones, typing accents on keyboards is simple: just hold down the letter you’d like to accent, and a menu will pop up. To type Spanish accents and characters on your smartphone, just press and hold the letters or symbols and a menu will pop up. To turn question marks and exclamation points upside down, hold these buttons down and you’ll see a menu with the inverted versions. Do you know how to type Spanish symbols on your keyboard now? Write a Spanish sentence below, using some Spanish accents and characters! I even love that awkward feeling of trying to use the lingo with the locals and being met with a confused stare or nervous laugh, because I know it’s the start of something great: if I persevere, I’ll be fluent one day. Despite this, I’ve done most of my language learning missions without spending long periods of time abroad. Living in a new country sounds exciting, but it’s not very practical. I’ve got all kinds of good stuff going on here that I don’t want to leave behind, like a relationship, job and friends. I love travelling in Spain but I’m can’t move there. So I’ve found a way to become fluent in Spanish from home instead. Maybe you’re in a similar situation. You want to learn Spanish, but for work or family or whatever reason, you can’t move to Spain or Latin America to do it. If this sounds like you, I have good news: you don’t need to go abroad to become fluent in Spanish. You can do it from the comfort of your own home, in your fluffy socks. I did something similar back in July, when I decided to become fluent in French from my living room. Now, I’m planning on doing the same thing for Spanish. In this article, I’ll share my step-by-step plan that you can use to become fluent in Spanish without leaving the house. It seems like every time people start talking about foreign languages, someone tells the story about how the only way to learn a language is to go to the country. Sometimes they’ll give examples of a friend or a family member who went abroad and picked up the language easily because they needed it to survive. But the idea that there’s something magical about being in the country that makes language learning effortless is simply not true. For a start, it’s easy to live in a foreign country without learning the language. Immigrants do it all the time (especially the ones from Western societies who are sometimes referred to as expats). Secondly, if you don’t have a decent command of the language before you get there, you’ll struggle to make friends in the language you’re learning. And if you’re an English speaker, unless you’re going somewhere remote where no one else speaks English, you may have to battle to find opportunities to speak the language, because everyone will want to practice their English with you. I stopped focusing on trying to memorise grammar rules and vocabulary and started using the language to communicate with human beings. I spent lots of time practicing speaking. I learnt Italian faster in Italy because I spent less time studying grammar rules and more time chatting to Italians. But you don’t need to be in the country to do that. The good news is, you don’t need to be in the country to do these things. These are situations you can easily recreate at home: I know because I’ve done it with the other languages I’ve learnt. In the next section, I’ll show you how you can apply these ideas to become fluent in Spanish from home. I understand most things I hear (except strong accents, local slang, or specialist vocabulary). I can talk quickly and native listeners understand me without straining. I rarely have to search for words (unless it’s specialist vocabulary or a momentary slip). I probably still make mistakes and have a slight foreign accent, but they don’t impede communication. If you’re the type of person who needs a bit of pressure to get motivated, you could consider setting yourself the goal of passing an exam. The DELE Spanish exam at B2 level would fit in with the definition of fluency described above. Your deadline will depend on how much time you can put aside to study each day. If you’re starting from scratch, you could reach this level of fluency in 1 year by studying for 2 – 3 hours per day. If you’re already at an intermediate level, you could get there in about 6 months. If this sounds intense, don’t worry – this doesn’t mean hours of “school-like” studying from grammar books. The better you get at Spanish, the more you’ll be able to fill this time with stuff you really enjoy doing, like chatting to Spanish speakers, reading books/magazines/newspapers or watching TV and films. How to learn a language at home (even if you’re really lazy). The 11 easiest languages (and how to make any language easy). Also, remember that by the end of the year, you’ll be fluent in Spanish. It’ll take time and effort, but it’ll be so worth it. Once you’ve got your deadline, break it up into mini goals. This is important because a year feels very far away, which makes it easy to find excuses to keep putting off learning Spanish. Here’s an example of 3 mini goals you could set yourself over the course of the year. After 3 months: I can have conversations about simple things. After 6 months: I can talk comfortably about familiar topics. What if you don’t have that much time to dedicate to learning Spanish each day? No worries! There’s no rush – just decide on the amount of time you can dedicate to learning Spanish and adjust your deadlines accordingly. Alternatively, you could aim for a slightly lower target (B1 CEFR level) – still a great level where you can chat quite comfortably in everyday situations. Keep in mind that these figures are guidelines: everyone’s different and how long it takes could depend on several factors, such as your experience with languages, whether you are able to stay positive and the amount of speaking practice you do during this time. Don’t worry if it takes you a little longer than anticipated: keep going and you’ll get there! To become fluent in Spanish, decide which actions you’ll need to take each day, then ACTUALLY DO THEM. Forgive me for shouting, but this is the most important bit of the whole guide. How long you’ll study each day. When and where you’ll do it. What you’ll do in that time. Listen to Coffee Break Spanish as you eat your breakfast. Review vocabulary using a flashcard app on your phone whilst stuck in traffic or waiting for the train. Listen to an audiobook for Spanish learners during your commute. After work, you could do a lesson with an online Spanish tutor, study a chapter from a textbook or if you’re feeling tired, chill out in front of some YouTube videos like Spanish Extra or Easy Spanish. If you feel like going out, you could meet a native Spanish speaker in your area and set up a language exchange at the pub (more on this later). We all have different timetables and tastes, and what works for one person may not work for another. I like to get up an hour early and squeeze my study time in before work because I tend to get distracted later and may not get around to studying. However, some people feel more focused in the evening. Take some time to experiment until you find a language learning routine that works for you. One thing I recommend to pretty much everyone however, is to get yourself some headphones and listen to podcasts like Coffee Break Spanish and Notes in Spanish as you go about your day: on your commute, walking to work, running in the park, washing the dishes, cleaning the shower etc. It’s amazing how much extra Spanish you can squeeze in by doing this, and it doesn’t take any time out of your day. Also, remember that you don’t need to start everything at once. Routines that are established slowly are usually the most steadfast. Work towards your ideal routine little by little: for example, if you plan to study Spanish for an hour before work, you could start with 5 minutes, then increase your study time for one minute per day until you’re up to 60. Importantly, once you’ve sorted out your routine, focus all of your energy on that and forget about everything else. If you focus on steps 1 and 2 (setting a goal and deadline) but forget about the things you need to do each day to actually get there, you’ll never become fluent in Spanish. This is the way people normally try to achieve things and the reason lots of people never reach their language learning goals. Alternatively, if you skip the first two steps and just focus on doing your Spanish routine every day, you’ll become fluent in Spanish sooner or later anyway. Having a goal and a deadline is handy because it gives you something to aim for. But the real secret to becoming fluent in Spanish is getting into a good routine. If you only follow one step from this guide, make it this one. If you’re going to be spending a couple of hours a day learning Spanish, you’ll need to find some fun and useful things to do during that time. Experiment with different resources like textbooks, podcasts and YouTube channels for Spanish learners until you find things you like that help you make progress. Not sure where to find tools for learning Spanish? These articles might help. Learning a language is like watching a plant grow. From day to day, the changes are almost imperceptible. But if you can step back and look at it after a few months, you’ll see that it’s grown loads. Language learning happens so gradually that it can feel like you’re not making progress, which is demotivating. One way to resolve this is to record yourself speaking every now and then so you can look back and notice how far you’ve come. This will show you that your hard work is paying off and give you extra motivation to keep going. To see what I mean, check out what happened when I recorded my progress in German over 3 months. Day to day, I felt like I was getting nowhere, but when I compared day 1 with day 90, I was quite pleased with how much I’d learnt. One reason learning a language in the country seems easier than learning in the classroom is that it transforms a boring school subject into a way to communicate with other human beings. Instead of studying to pass a test, you’re learning Spanish so you can chat to your mate Carlos about a girl he met last weekend. The more you can see Spanish as means of connecting with people, the more motivated you’ll be and the faster you’ll learn. But how can you do this without living in the country? You can take advantage of this newfangled technology called the “Internet”, which allows you to connect with Spanish speaking people on the other side of the planet, from the comfort of your living room. This tool, which has revolutionalised language learning, is your most important ally in your quest to become fluent in your Spanish without putting pants on. I use fab website called italki, where you can find loads of native Spanish tutors waiting to talk to you on Skype for a very reasonable price. Just this week I’ve had lovely chats with María from Venezuela and Carlos from Mexico for less than $10 an hour. If you fancy giving it a go, click on any of the italki links on this page to get a free $10 dollar voucher after your first lesson. Alternatively, if you’d rather make real flesh and blood friends, you can use the internet to find Spanish speaking people in your area. Conversation exchange is a great website for this. Grammar exercises and language learning apps might make you feel like you’re doing something useful, but the best (and most enjoyable) way to learn how to speak a language is by talking to people. The more you practice speaking, the more fluent you’ll be. Simple as that. Whether you pay tutors for online conversation lessons, or set up language exchanges, make it your priority to find people you enjoy spending time with and practice speaking Spanish with them as much as possible. Once you do this, becoming fluent in Spanish is just a matter of time. Next, I’ll explain how I’m going to apply these ideas to help me become fluent in Spanish from my living room. I’m already at an intermediate level in Spanish, so I’m going to give myself 6 months to become fluent. I’m aiming to learn Spanish for 2 hours a day over the next 6 months. As I’ve just finished my French mission, I already have a routine that sets 2 hours aside for language learning, so I just need to switch the language from French to Spanish. However, if I was building a routine from scratch, I’d start very small, say 5 minutes per day, and increase the time gradually using the technique I discussed in step 3. Watch Spanish CNN while I eat breakfast and drink coffee. Write a daily diary in Spanish. Do at least 3 conversation lessons per week with my Spanish tutors on Skype (via italki). Learn 200 words per month (about 6 per day) on my Flashcard app. To find out how I use flashcards to learn vocabulary, check out this post on how to remember words in a foreign language. Listen to Spanish podcasts while I’m going about my day. Are you learning (or planning to learn) Spanish from home? Leave a comment and let me know: What’s your goal and deadline? Do you have a Spanish learning routine to help you get there? Having a conversation in Spanish can feel scary at first. There are so many things that could go wrong! You forget a word or some grammar mid-sentence. You don’t understand what they said to you. They reply in English! You’re not sure what to say.